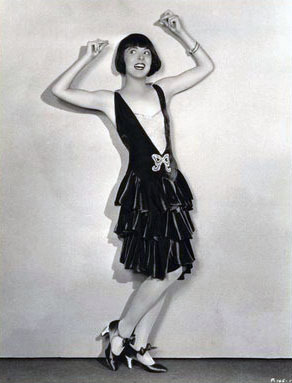 Colleen Moore, America's perfect flapper. As anyone who has seen Gloria Swanson freak out in Sunset Boulevard knows, in the 20’s, the actors had faces. Also, they had fashion. Often, actors in silent films were portraying archetypal characters who were easily identified and defined by their clothing, hair, and makeup. For women, this meant two main categories of characters: the virgin and the vamp. Beneath these two umbrella archetypes were a variety of personas- the flapper, the ingénue, the girl next door, the “It” girl. Fashion in film helped to define these characters to the American public, and in turn says something about how women were defined by what they wore during that era. Film also helped to spread fashion trends out of the city to outlying or rural towns, giving the rest of the country a taste of the new styles emerging from a city center like New York. Ultimately, film played an integral role in defining the ideal style for the twenties woman, and comments silently about what clothing projects about the wearer. 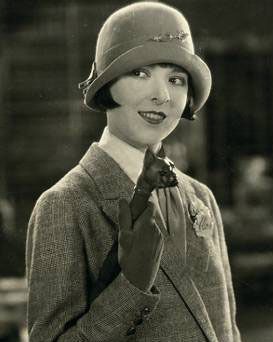 Above: Box-office gold, Colleen Moore, in the many costumes of the ideal flapper. Perhaps the most iconic persona of the silent screen, the archetypal flapper is also the most responsible of all the film personas when it comes to inspiring the fashion, both of the twenties and the modern era. Actress Colleen Moore personifies this character, with her bold, parisienne-esque fashion choices depicted above. From the long, lean, deep-v flapper evening dress, to the androgynous garçonne, to the eastern-inspired turbans and head-wraps, Moore’s on-screen style runs the gamut of flapper fashion. Moore starred in films with titles like Flaming Youth, Painted People, and The Perfect Flapper, and became a sort of icon of the flapper to the American public. Her characters were fun, carefree, adventurous, and free-spirited, but never vampy or obscene (unless you count putting perfume on your lips as obscene). Her portrayals helped make the flapper accessible to the public, while Moore’s on-camera style gave dreamy girls who saw her films something to look up to, fashion-wise. When most girls owned one, maybe two dresses, seeing Moore wear a different dress, usually heavily beaded or trimmed in fur, or covered in an ultra-modern art deco print, in every scene of Flaming Youth provided a sort of perfect ideal of this mysterious modern woman, the flapper, who everyone was trying to understand and explain.